While the demand for footwear decreased in the United States and Europe from 2009-2014 due to the recession, analysts expect a strong recovery in the coming years. By the end of 2019, the global shoe market is forecast to reach 216 billion dollars, according to a report by TechNavio – Infiniti Research Ltd. Given consumer spending patterns, it's no surprise that brands in the apparel industry are increasingly looking to footwear to improve their profit margins. Read on to learn about the top trends shaping the footwear market. In addition, new advertising campaigns should help to boost sales. Celebrity endorsements and social media marketing are expected to contribute to market growth. The Olympics taking place in Brazil will also offer an opportunity for companies like Nike to showcase their newest products. For many consumers, gym clothes are now a part of their everyday wardrobes. Wearing casual athletic wear all day has become more socially acceptable, and athleisure is one of the hottest trends in the apparel industry. Companies like Sketchers are benefiting from consumers’ desire for comfortable, walkable styles. 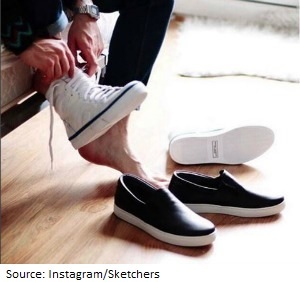 Sketchers’ revenue in 2015 increased 32 percent over the previous year. However, with more than 700 women’s athletic apparel brands in the market, competition is stiff. While footwear provides enticing opportunities for growth, retail chains like Macy’s and Kohl’s face ongoing challenges such as weak store traffic and a reliance on discounting. The reality is e-commerce is fundamentally changing the way many consumers shop, and online competition is making it difficult for many brick-and-mortar stores to gain traction. With price comparisons, product reviews, and unbeatable convenience, online shopping offers compelling benefits to consumers. “The online industry has gained wider acceptance among price-conscious consumers, and this trend will carry the industry through the next five years,” according to the report Online Shoe Sales in the US by IBISWorld. Need more information? Get in-depth data and analysis on the footwear industry by searching reports on MarketResearch.com. Click the button below to learn more.